First in this week... 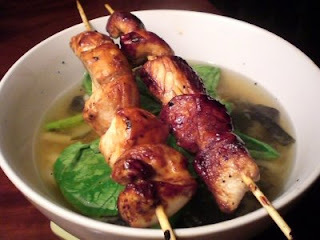 Truffle from What's On My Plate with a favorite of hers (and mine)...Chicken Yakitori with Udon Noodles Doesn't it look tempting? I could really go for some nourishing and tasty soup right now. 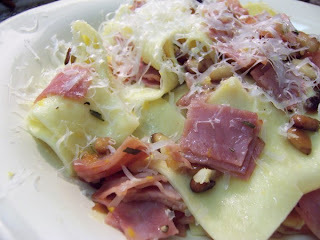 Katie of Other People's Food found this recipe for Pasta with Ham, Pine Nuts & Rosemary Sauce in the local paper. I can't wait to try it out myself. 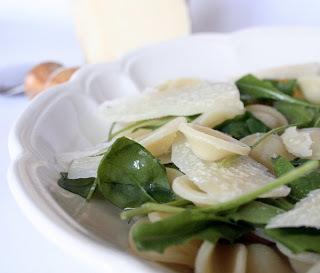 Andreea of On Food & Wine is a jet lagged, first time PPNer, but took the time to make this quick and delicious plate of comfort food...Rucola & Pasta. I'm not sure what rucola is called here in Canada...it looks like baby spinach to me. 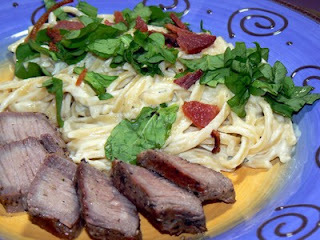 Mrs W of Mrs W's Kitchen is also a first time PPNer and she has a great pasta dish with no pasta! Spaghetti Squash with a Pumpkin Sage Sauce. Sounds perfect for low-carb dieters and the rest of us. 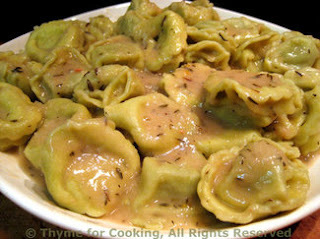 Katie of Thyme for Cooking is back with a funny story (at least for us) and a great dish of Cappelletti with Cream Sauce. 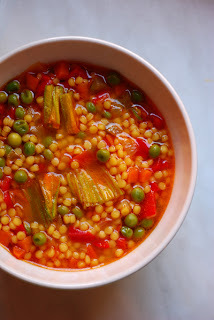 Haalo of Cook (Almost) Anything shares a fabulous and brilliantly colored Vegetable Soup with Pastina. Perfect for cool grey days. How could this on the table NOT brighten up the day! 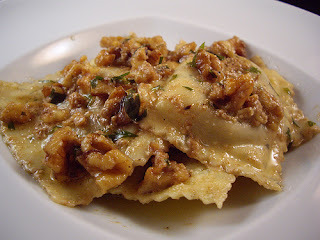 Becke, the Columbus Foodie has a real treat for us...Gorgonzola Ravioli with a Walnut Sauce. What else can I say, but...dig in! Theresa, the Food Hunter's Guide brings another really special dish to the table - Ricotta Gnocchi with Sausage & Fennel. Wow. 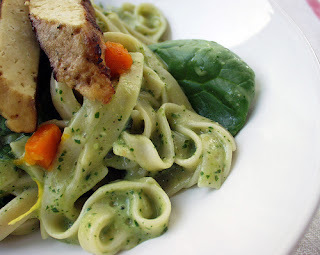 Dayna, my very favorite Vegan Visitor is back with a glorious Creamy Spinach Pesto Fettucini. 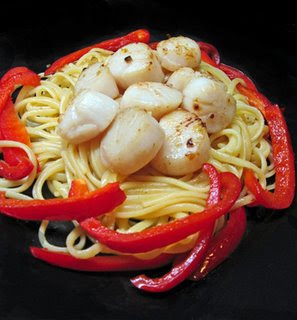 Brilynn of Jumbo Empanadas has the perfect Scallop with a Spicy Honey Glaze pasta dish to die for! 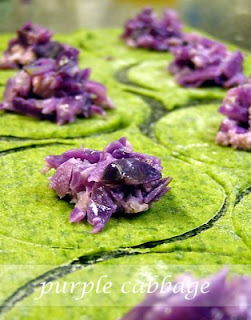 Gattina of Kitchen Unplugged will be away for a while and we will certainly miss her glorious dishes, but she did share this absolutely stunning dish of Spinach Ravioli with Purple Cabbage. 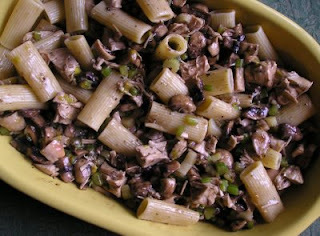 Ferdzy of Seasonal Ontario Food was sure that there would be a ton of leftover turkey dishes here, but her Turkey Mushroom Pasta is the only one (at least so far) and it looks great. 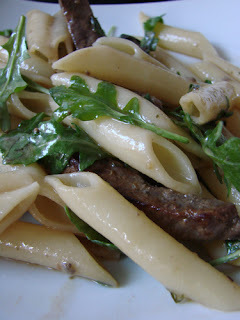 Paz of The Cooking Adventures of Chef Paz is back with a mouth-watering dish of Penne with Beef & Arugula. I'm ready for that! 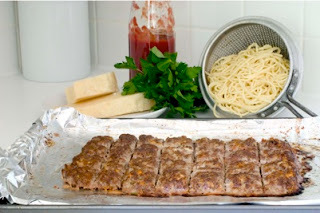 Dana McCauley of TopTenTable joins the PPN gang for the first time with this very quick way to make Spaghetti and "Meatballs". I'm waiting for her Mac & Cheese dish - hint, hint Dana! 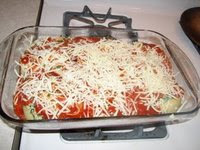 Amy of Life of a Newlywed is back with a very cheesy dish...Stuffed Pasta Shells - one of my favorites. Sher of What Did You Eat? had a senior's moment at the grocery store and forgot the mushrooms, but her dish of Spaghetti with Goat Cheese and Arugula sound perfect to me. 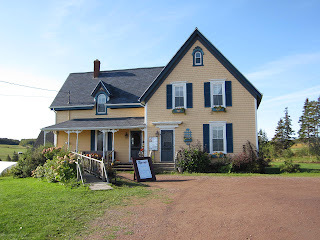 Jenni of I Love Milk & Cookies joins us from Down Under where it's Spring and I'm jealous, at least of all the asparagus. 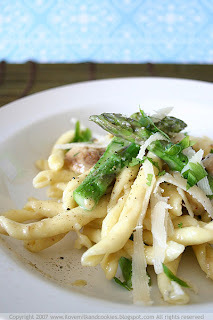 She also comes to the party with a very cheesy dish - Three Cheese Pasta with Asparagus. 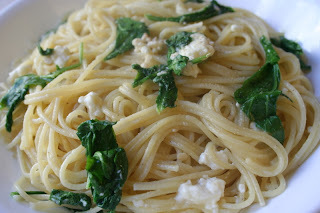 Alisha of Cook, Craft & Enjoy is back and she also has an awesome cheese dish...Stilton Linguine. My son-in-law is going to really love this week's roundup as his favorite color is blue - at least in cheese! 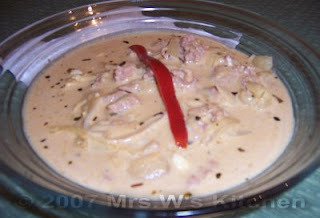 Finally, it's my turn - also a cheesy comfort food dish that I just squeaked in. This one...Potato & Leek Sacchettini with Goat Cheese & Fresh Herbs is another simple way to add some quick comfort to your life. 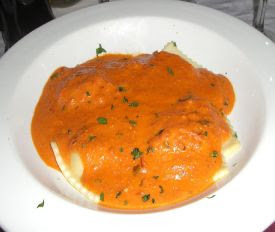 And another creamy dish just in from Mansi at Fun and Food - Stuffed Ravioli with Saffron Cream Sauce. Aren't you drooling? I am! 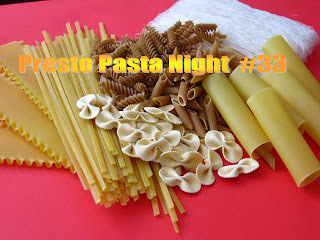 Don't forget to join in the fun for next week and please visit the Presto Pasta Gang on Facebook. As always...a very big thank you to all of you for playing along and visiting every week!!! wow! 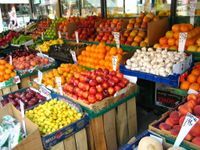 Nice looking photos and recipes. I think I'll have to up my effort next time. Perhaps the mac and cheese is too pedestrian for this group? Regardless, I'll post it in a week or so Ruth. Dana - are you kidding! Mac & Cheese is awesome, but what ever you decide to share will be appreciated by all. Mansi, of course you're in for this week! 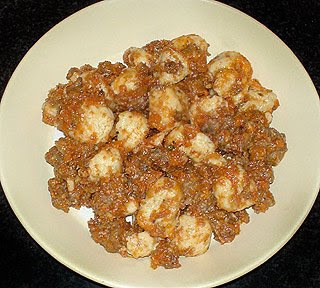 Check it out and thanks for sharing a great dish with the rest of us. There it is, the best pasta on the Internet. I especially like the homemade green ravioli picture this week. And on another note, hanks for joining our Facebook group! how adorable these sacchetini! You're right, simple yet comforting! rucola is rocket or arugula. 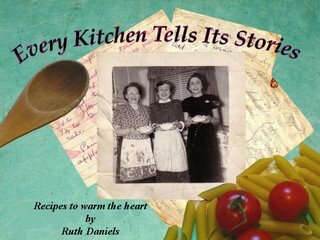 Ruth PPN was such a super idea. I can't believe all the great dishes everyone comes up with each week! I've got some pasta to share with you, just have to find the time! Have a great weekend! Has everyone (but me) just taken a food photography course? What a gorgeous round-up!